LONG, Jefferson Franklin, a Representative from Georgia; born a slave near Knoxville, Crawford County, Ga., March 3, 1836; self-educated; became a merchant tailor in Macon, Ga.; elected as a Republican to the Forty-first Congress to fill the vacancy caused by the House declaring Samuel F. Gove not entitled to the seat on December 22, 1870; served from January 16, 1871 to March 3, 1871; was not a candidate for renomination in 1870; delegate to the Republican National Convention in 1880; resumed business in Macon, Ga., and died there February 4, 1901; interment in Lynwood Cemetery. 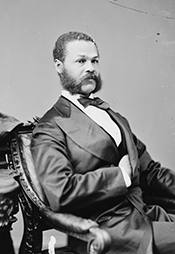 Jefferson Franklin Long in Black Americans in Congress, 1870-2007. Prepared under the direction of the Committee on House Administration by the Office of History & Preservation, U. S. House of Representatives. Washington: Government Printing Office, 2008; Matthews, John M. Jefferson Franklin Long: The Public Career of Georgias First Black Congressman. Phylon 42 (June 1981): 145-56.